In a small bowl, stir oil, ground chipotle, salt, orange zest and garlic together into a paste. Using a rubber spatula, spread chipotle mixture over both sides of pork. Let stand for 15 to 30 minutes. Prepare a medium-hot fire in grill. Place chops on grill and close lid. Grill over direct heat, turning once, about 4-5 minutes per side, until the internal temperature of the pork on a meat thermometer measures between 145 degrees F. (medium rare) and 160 degrees F. (medium). During the last 2 minutes, brush chops on both sides with honey. Remove from grill and let rest for 3 minutes. * You can substitute another smoked chile powder per heat preference. 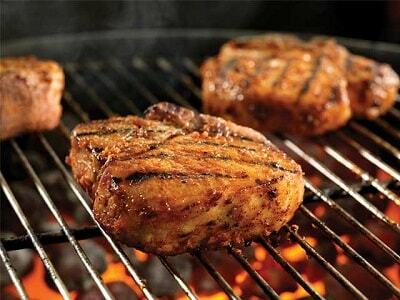 Serving suggestions: These grilled pork chops are great with mashed sweet potatoes and sautéed green beans as side dishes. Recipe and photo courtesy of Pork be Inspired . Used with permission.